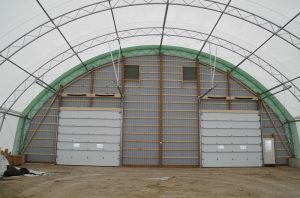 Vertical Buildings fabric buildings are the ideal building solution for hay, commodity and vehicle and equipment storage, protecting your crop and capital assets from the harmful effects of weather exposure. 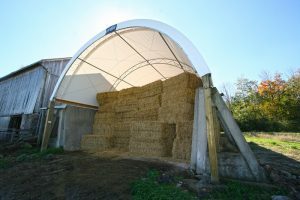 A fabric structure from Vertical Buildings with help decrease the amount of any spoiled hay, commodity or grain and preserve the feeds nutritional and sale value. 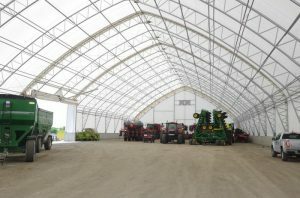 The exceptional height and design of our fabric buildings have no interior columns, allowing for easy access to your crop and convenient handling by farm machinery. 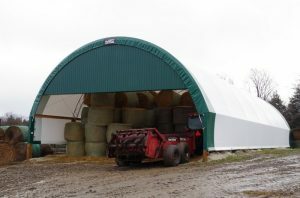 While protecting your investments from the damaging effects of snow, rain, and UV rays that can cause ceased parts, rust, and increased wear-and-tear, our fabric buildings improve the longevity of your vehicles and equipment and reduce maintenance costs. 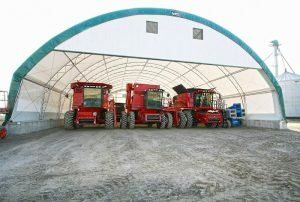 The superior ventilation and air quality eliminates moisture, reducing rust. 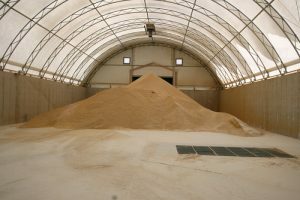 The fabric covers also allow for bright natural light, creating a safe working environment for crews working inside the building.